Despite better than expected inflation and confidence data, the euro extended its losses today below 1.19. There’s some talk that the ECB could opt for a dovish taper next week to avoid driving the euro higher and while it is not clear if they feel this way, the momentum is certainly tilted downwards for the euro. Sterling on the other hand held up well in the face of U.S. dollar strength and this resilience triggered a massive reversal in EUR/GBP. Brexit may be on everyone’s minds but data from the U.K. was healthy with shop prices falling at a more moderate pace in August and mortgage approvals rising by the largest amount since March 2016. With that in mind, U.K. consumer credit grew at its slowest pace since April 2016, which is a sign of weakness. The most important event risk for the U.K. this week comes on Friday when the manufacturing PMI report will be released. The sharp rise in the CBI index reflects stronger manufacturing activity and if the PMI report confirms that, we could see EUR/GBP back down at 91 cents. Technically, after rising to its strongest level since October 2009, EUR/GBP is poised to end the day below the first standard deviation Bollinger Band for the first time in 4 weeks. 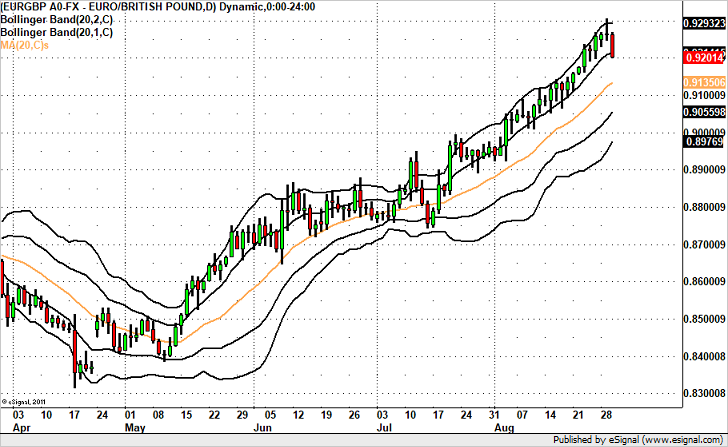 It now spars poised to move down to the 20-day SMA near 0.9135 and possibly even to 91 cents.